for WB6 XP and Vista. the Relent skin using the WB utility. 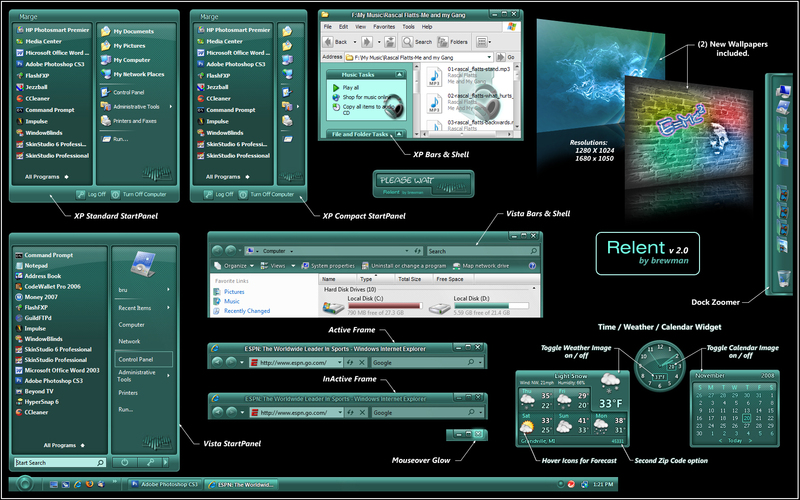 custom XP shellstyles, and multimedia images. (2) Resolutions: 1280x1024 and 1680x1050. awesome skin and great colors. The bar graphs (full portion) for drive space are not centered within the bar. Great to see you back - very happy with this blind. looks good, but I don't buy them anymore. Keep it up. Damn i need to learn how to skin! Decent work. Proved more enjoable after purchase. � �Nice ... was worth buying it! Everything on this looks excellent, I cant help to wonder though, when using a taller start menu with more icons whether there is a double tiled line in the textured area. A major bone of contension with me as far as skin quality goes. I have found no way to get around that other than using non-rounded rectangular panels... in fact I think it may be impossible and I cant tell from the current screenshot how it would look. Otherwise, nice and original and looks highly re-colorable. Thumbs up from me. Thanks for the nice complliments. to tile properly under all the different combinations of icon size and length of menu. Watch, someone will prove me wrong (I hope not). Vista was a different story. The XP settings did not work in Vista ... got "banding". jim, this is superb! my only complaint is i didn't get to test it anywho, i'm really glad you're back and releasing great stuff again. Great skin. Not sure if I love the default color but I can change it in WindowBlinds. this is a master skin and only 3 1/2 stars, c'mon wb judges, I think you could have given it a higher rating than that. At bare minimum it's a 4 and probably closer to 4 1/2 IMHO! Brew, this is an excellent skin, I would hope in a couple of years that I could create skins of this quality - keep up the great work!! !